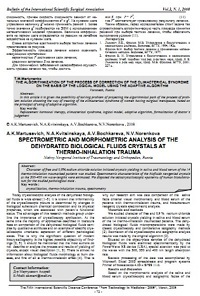 Character of free and 0,9% sodium chloride solution initiated crystals yielding in saliva and blood serum of the 14 thermo-inhalation traumatized patients was studied. Spectrometric characteristics of the biofluids newgenied crystals at the 300-400 nm wave-lengths were estimated. We disposed the teziocrystalloscopic «pattern» of human biosubstratum for the studied pathological state . Maksimov S. A., Kureljak D. S. Some characteristics of separateness of facia of the whey of blood. Bulletin of the International Scientific Surgical Association. 2006; (3) 1: 63-64. Martusevich A. K., Kamakin N. F. Crystallography of biological fluid as a method of evaluating its physicochemical characteristics. Bulletin of Experimental Biology and Medicine. 2007; (3) 143: 385-388. Shabalin V. N., Shatokhina S. N., Yakovlev S. A. Character of blood crystallization as an integral index of organism homeostasis. Phys. Chem. Biol. Med. 1995; (1) 2: 6-9. Yakhno T., Yakhno V., Sanin A. et al. Dynamics of Phase Transitions in Drying Drops as an Information Parameter of Liquid Structure. Nonlinear Dynamics. 2002. (4) 39: 369-374.